The administration of Camden Catholic High School announced the hire of Christine Matera as head girls basketball coach, succeeding longtime coach Christine Palladino, who retired following the 2017-18 season. Matera is a 2007 graduate of Camden Catholic and has served as an assistant coach since 2015 under Palladino. She was an integral member of the school’s first girls’ basketball state championship team (2005-06), which was recently inducted into the CCHS Hall of Fame in April 2018, and has also taught at the school since 2014. Matera graduated from Harvard in 2011 with a degree in psychology. There she was an integral four-year contributor to the women’s basketball team, helping guide the team to a 2008 Ivy League title. She graduated ranked third in program history in games played and fourth in three pointers made, and was among a select few in program history to be selected captain for two consecutive years. She is the fourth all-time leading scorer in Camden Catholic girls’ basketball history. Matera is currently embarking on her Master’s degree in secondary education at the University of Pennsylvania. 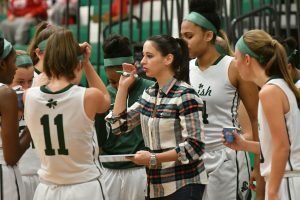 Coach Palladino will remain on the Camden Catholic faculty as a history teacher and is also expected to remain on the coaching staff for Irish girls’ basketball. She retires with a 660-252 career record, the second best in South Jersey girls basketball history.